Ah, New York, you are wonderful. The food. The stores. The park. Oh, and the amazing museums that can keep my busy all the time. After a few months of reading articles and seeing Tweets about all the wonderful new exhibitions opening in New York during the fall, I was excited to see them for myself. I went up to New York for the weekend before classes began with a list of exhibitions (and cafés and restaurants to keep us well fueled in between). I visited five museums, and for me, it was the perfect way to end winter break. Most of the time when you hear people talk about visiting art museums in New York, they talk about The Met, the Guggenheim, and maybe the Whitney Museum of American Art. One place that I get the sense attracts fewer tourists is The Jewish Museum. But let me tell you, The Jewish Museum is doing really cool things with their exhibitions. The museum is housed in what was once the mansion of the Warburg family, including philanthropist Felix Warburg. The architecture inside the building is beautiful. The two exhibitions I saw at the Jewish Museum were both so impressive and innovative. “Take Me (I’m Yours)” explored ideas related to commercialism and consumerism and let visitors take home a variety of items. “Pierre Chareau: Modern Architecture and Design” (mentioned in an older blog post) showcased the unique furniture designs of the French designer. The exhibition also included the most awesome virtual reality component in which visitors saw the furniture that was on display in environments that felt immersive. One room in “Take Me (I’m Yours)”- visitors could take a photo off of the wall. I couldn’t visit New York without going to one of my favorite museums, Cooper Hewitt. The museum had two fantastic exhibitions looking at design, sustainability and textiles. One of the elements of Cooper Hewitt that has always stood out to me is the way their exhibitions showcase projects that are being used at that moment- projects that are really making a difference for communities. Christina Kim’s work- she repurposes saris from India for appliqués on new pieces. Process lab that challenges visitors to think abut how design can help them solve challenges in their communities. This was the first time I have ever been to the New Museum. I had been meaning to get there while I was in New York last sumer but didn’t make it. That only pushed it up higher on my list of places to get to during this trip. Their Pipiotti Rist show was up and all I can say is wow. wow. wow. This exhibition was extremely popular- I went on the final day of the show and waited in a line for almost an hour and a half (it was worth it). And I was not the only one who was eager to get to the museum: suposedly this was the most visited exhibition ever at the New Museum. 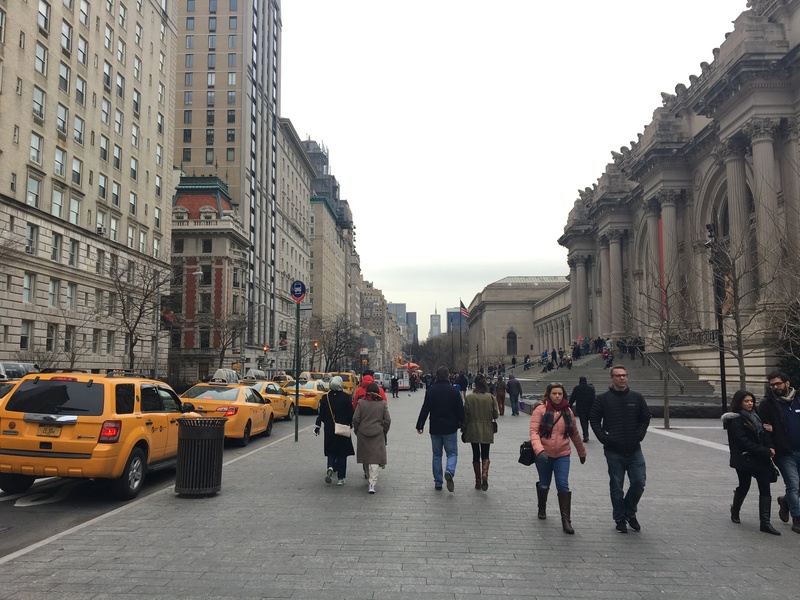 What’s a trip to New York without visiting the Met? Good but not excellent. I was dying to see their Costume Institute exhibition “Masterworks: Unpacking Fashion.” The exhibition explored pieces that marked important points in the evolution of fashion- all the pieces were striking, to say the least. We also checked out the new Max Beckman exhibition (and spotted Larry David enjoying some artwork). Kerry James Marshall. His artwork is extraordinary. I missed his show when it was at the Museum of Contemporary Art in Chicago so I made sure not to miss it in New York. Marshall re-imagines many classic scenes from art history with black characters. His artwork blew my mind. The other amazing part of this exhibition was observing other visitors reactions and conversations. Everyone seemed genuinely engaged with the artwork and so excited to see these types of stories being told through art. The New Yorker did a great piece on Marshall and the exhibition as a whole in November. The article does a nice job describing the different types of artworks on display but also the real significance that lies in this show. Peter Schjeldahl’s last paragraph of the article does a great job of summing it up. All photos by Hanna Cunningham. I’ll admit I love museums, so your blog really called out to me. I really enjoy the layout of your blog post, it reads just as easily (if not easier) than any other museum recommendation site I’d find in a google search. The best part is that I’ve only heard of one of the museums you mentioned (the world famous Met) so now I can look forward to my next visit to New York. The New Museum looks very interesting and cool, the blend between digital and art is stunning.